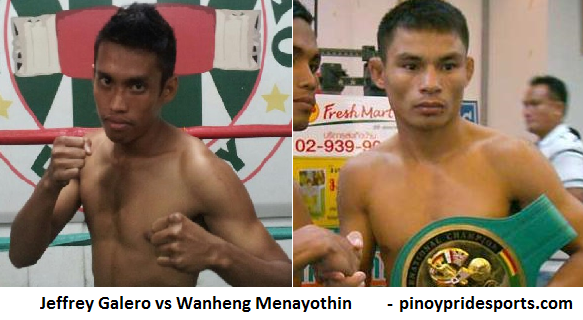 Undefeated fighter from the Philippines Jeffrey Galero will fight for the WBC World Minimum weight title against to also undefeated fighter Wanheng Menayothin of Thailand. This fight is scheduled on February 5, 2015 on Nakhon Sawan, Thailand. Jeffrey Galero is currently rank no, 2 in the Philippines in the Minumum weight and ranked no. 22 in the world, he is a 24 years old from Cagayan de Oro City, Misamis Oriental, Philippines. Galero wants to be the first world champion from his province. Currently he has an undefeated record of 11 wins including 5 wins by way of KO. This fight will be his first 12th rounder match of his career. Wanheng Menayothin is a 29 years old undefeated boxer from Thailand, he is a former WBC Youth World minimumweight champion, interim WBC International minimumweight champion, WBC International Silver minimumweight champion and currently the WBC World minimumweight champion. This fighter is ranked no. 1 in the world in the minimum division. A big break for the Filipino boxer, hope he get this one with a decisive end.